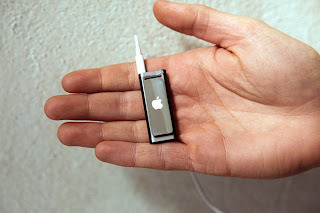 Apple's newest Shuffle (at almost 50 percent smaller than the previous Shuffles) could easily be mistaken for a stick of Trident. features no buttons and it pimps voice-identification technology. Dubbed VoiceOver by Apple, it works like this: You press the middle button for several seconds and a disembodied Steven Hawking-esque voice tells you what track or playlist you're listening to. It's fairly accurate at telling you the track — just as long as the name is not terribly complex. Rolling Stones? Clearly chirped by VoiceOver. But Sigur Ros? The program garbled something that sounded more like "boozy roogs." by all reports VoiceOver is about as refined as a gallon of crude oil. They're essentially running a Beta test here. Once they get the software fine-tuned, expect it to roll out on devices like the iPod Touch and iPhone 3.0.